Childhood obesity rates soaring to all time high levels and children’s activities are being cut from school programs left and right. This epidemic has become so serious, it’s important for us as parents to take notice and be proactive before a health problem might begin. September 6th has been officially declared as Fit Made Fun Day by LeapFrog. As a mom, I can absolutely appreciate one of the leading makers of children’s electronics taking notice of this childhood epidemic and doing something about it! This day aims to recognize the importance of being active, celebrating how LeapBand makes fitness fun and encouraging kids to experience an active and healthy lifestyle. The great thing about Fit Made Fun Day is that it doesn’t have to end on September 6th. You can get the kids outside any day to enjoy a Fit Made Fun party! I was able to participate in Fit Made Fun Day by being sponsored by MommyParty and received free products from LeapFrog and Clif Kid. Lots Of Fun Activities: Plan on having lots of activities to keep kids busy. Create obstacle courses, water and fun sports themed activities for the kids to engage in. Stay Hydrated: When kids are active outdoors, it’s incredible important to make sure they stay hydrated. Have enough bottles of water and sports drinks on hand and make sure everyone stops frequently for sips. Have Healthy Snacks On Hand: Healthy snacks are just as important as water when kids are active outdoors. Have plenty of protein rich foods on hand, like Clif Kid Z Bars and fresh fruits. The protein will help keep their energy levels sustained while the fruit will help keep them hydrated. Be Ready For Anything: When I planned my Fit Made Fun party, I had all intentions of having lots of kids over to partake in the event. Then life happened and all of my guest list ended up sick! But that’s ok, because I was ready for it! Aidan still got to enjoy his time outdoors and I was able to wrangle up a small group of kiddos who weren’t sick. Prizes: Have fun prizes on hand for the winners of each obstacle or activity. Something as small as a certificate has potential to make any child happy. I put together fun little gift bags with crazy sports bottles and Clif Kid Z Bars that everyone loved! 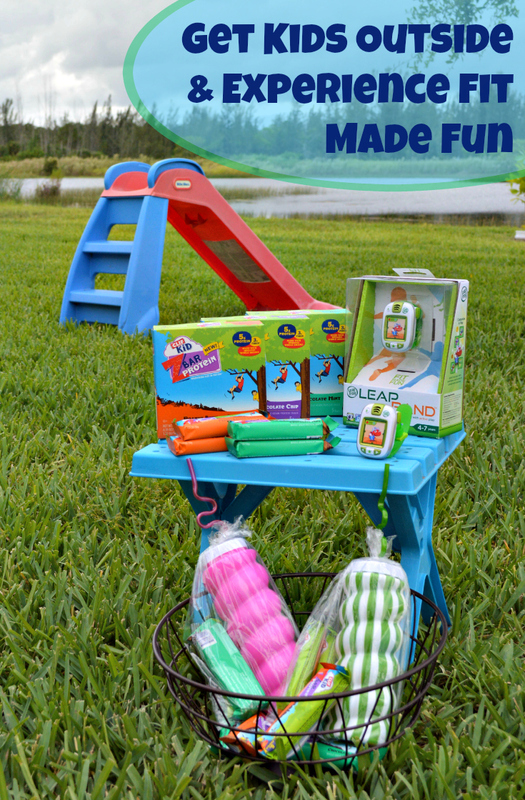 We were so excited to be included in LeapFrog’s Fit Made Fun Day! In honor of Fit Made Fun Day, LeapFrog has created a cool new wearable activity tracker, almost like a pedometer, for kids. This activity tracker encourages kids to get active by providing them a customizable pet that they feed healthy snacks, bathe, and more! Kids unlock the ability to do all of this and reach new levels by being active with their LeapBand! What a cool way to encourage kids to move their little bodies! Initially, we had a huge day of events planned out. Obstacle courses, relays and other fun sports themed activities. But then something terrible happened! All my my guests were sick! School has just begun here, so all of those wonderful new germs have made their way to my small group of mommy friends and their families. So our Fit Made Fun Day had to take the Plan B route! I found a lone mommy friend who didn’t have sick children, and we made a pool day out of it! Since it’s September in Florida, a pool day is a completely appropriate option for Fit Made Fun Day! The pool was a great way for the kids to get their 60 Minutes Of Motion in for the day, plus some! After the pool, the kiddos completed Healthy Habits Hunt. We played this very similar to an Easter egg hunt, but with healthy snacks such as Clif Kid Z Bars. 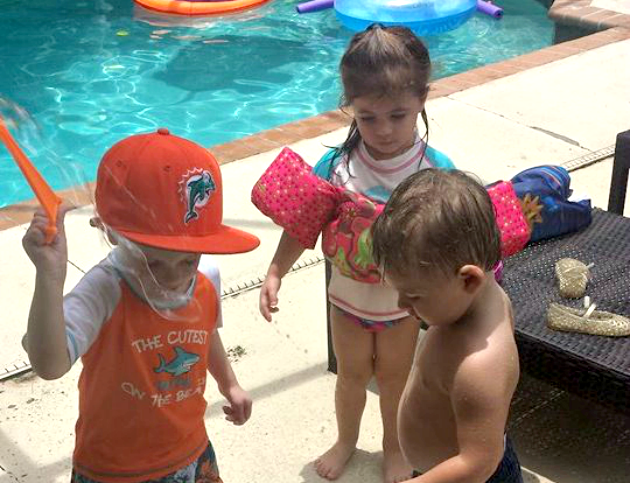 While wearing their LeapFrog LeapBands, they raced around the backyard to find their healthy snacks. The kids loved their Z Bars in Chocolate Chip, Peanut Butter Chocolate and Chocolate Mint…and so did I! The kids were finished with their snacks and re-hydrated just in time for the rain to set in. One of the most exciting parts about participating in LeapFrog’s LeapBand Fit Made Fun Day was being able to virtually attend LeapFrog’s attempt at breaking the Guinness World Record for the event, which was successful! Did your kids participate in Fit Made Fun Day? 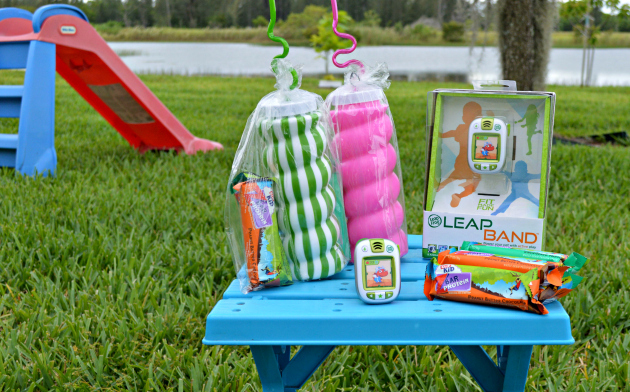 I received free products in order to host the LeapFrog and Clif Kid sponsored MommyParty. The opinions expressed here are my own. Previous articleIs Going Gluten Free Right For You?